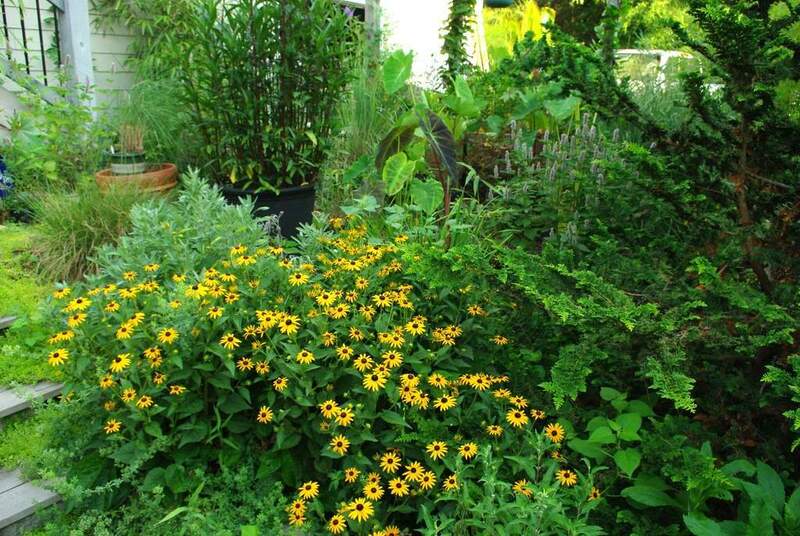 I've already taken a look at the "big picture" in the south part of my yard so you can see how the various planting beds work together (or don't depending on your tastes) and contribute to the garden as a whole. 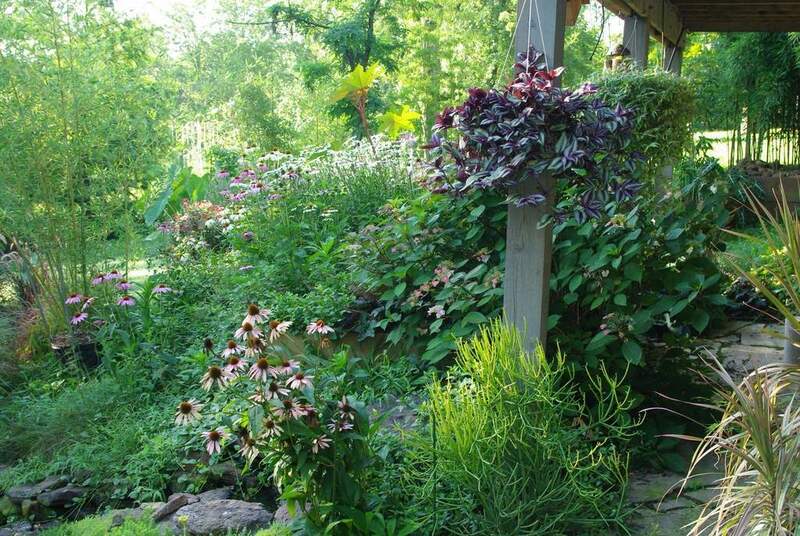 Those beds contain a lot of elephant ears, ornamental grasses, and some flowering annuals. 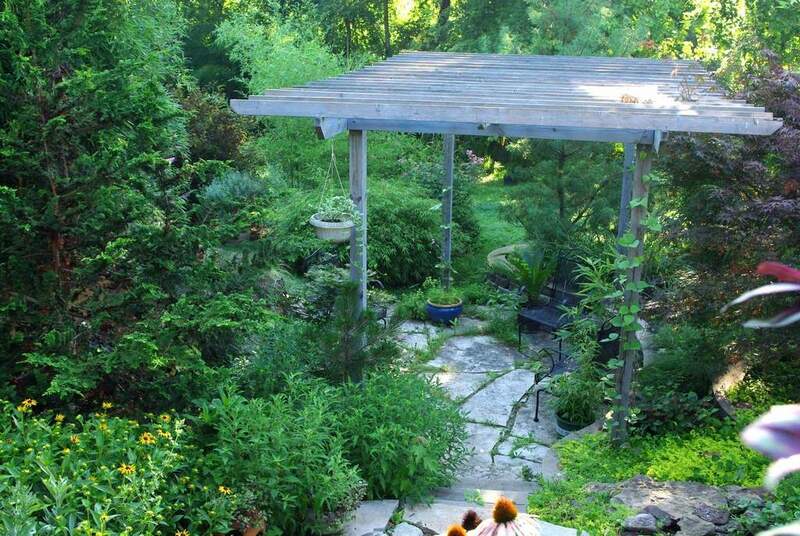 Today I'll move to the middle of my yard and show you the patio and surrounding beds. The patio area is pretty much the heart of my yard -- it's the anchor point around which many of the other beds were created. As you're looking at these photos, you may want to compare to the photos of the other part of my yard. You'll see some similar elements that tie things together, but some big differences too. For example, although you can see some elephant ears from the patio area, there are none actually down here. 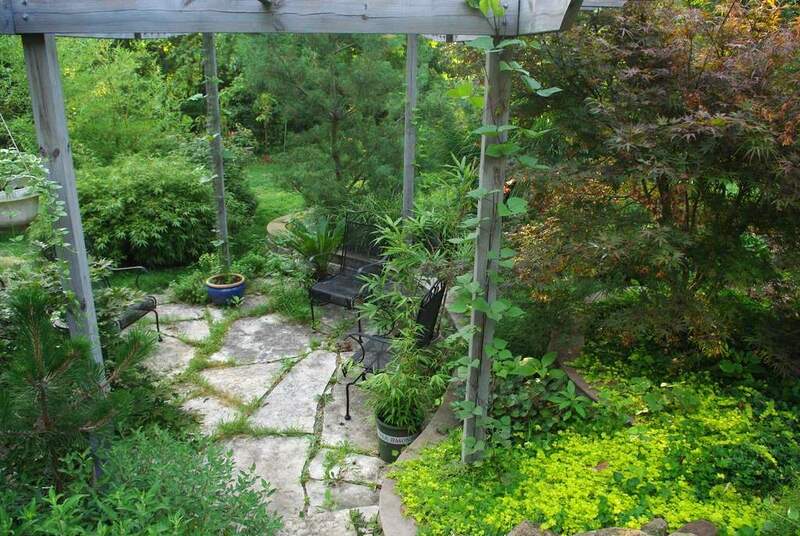 Standing on landing, looking down to weedy patio. Looking south (the plants in the previous photo are behind me now). Another view of the patio. 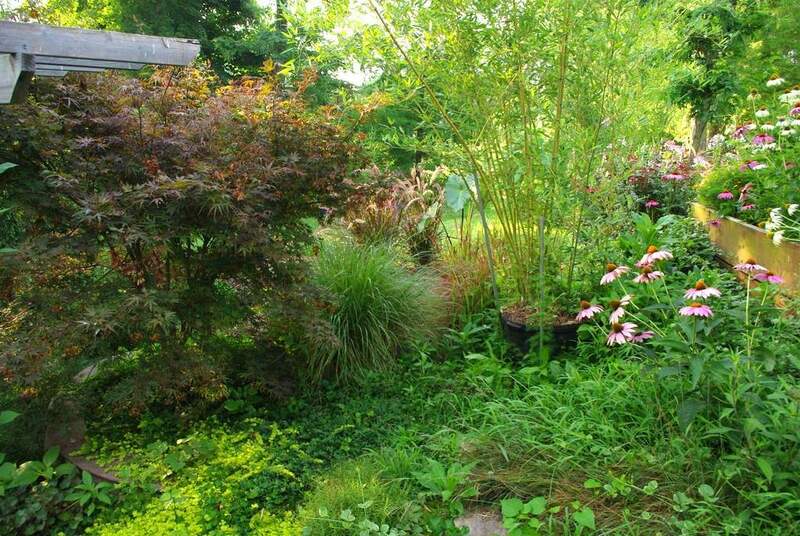 Lots of bamboo and Japanese Maples here. The view from my patio in 2011. Click to enlarge. The bamboo on the right side really makes the spot special I think. In another year or two it will really be impressive. I don't really want to call it a "waterfall", because that's not really accurate. It's more of a bubbling brook, and adds so much to this whole area. 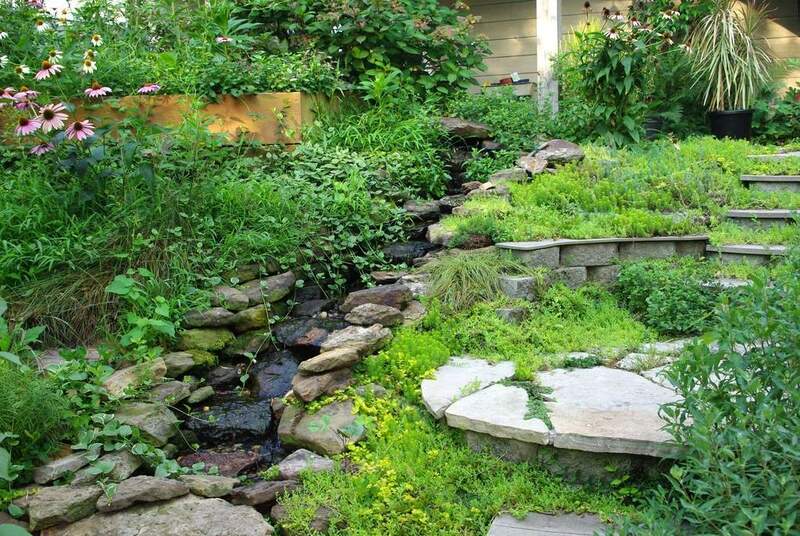 The sound, the movement, and the way it attracts birds and other creatures makes it an integral part of the garden. When the pump went out a month or so ago and I was waiting to have it replaced (still under warranty) it was so quiet and sort of "lifeless" back here. 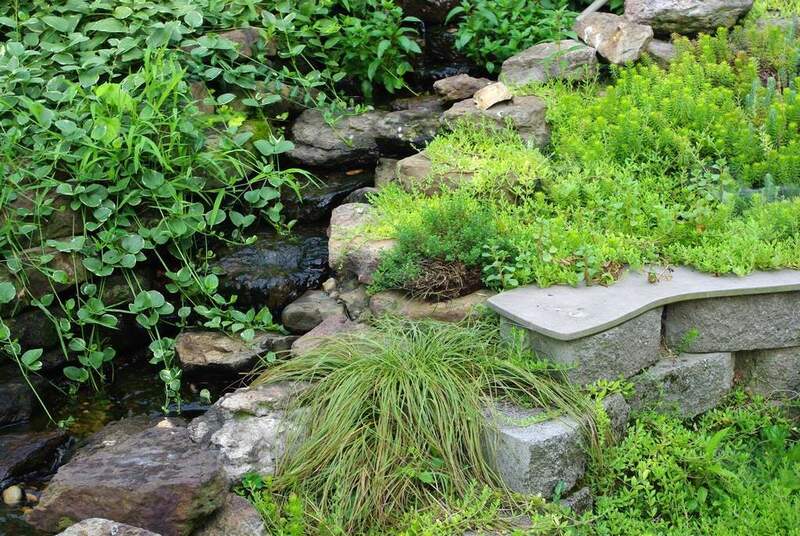 If you don't have the sound of water in your garden, you need to give it a try! The stream is really quite overgrown right now, especially with the vinca encroaching from the left. I haven't paid a lot of attention to the plants around the stream this year because I'm planning on ripping them all out sometime. Why? The stream needs to be redone as I made a few mistakes when I built it 5 years ago. It's a job I'm not looking forward to, as it means I'll have to start over again with the plants here. Oh, and it will be a huge amount of work... I mean fun. That is one of my favorite views in my garden! Although the "path" is more narrow this year than it has been before, I can still see almost all the way back to my veggie garden. Love it! 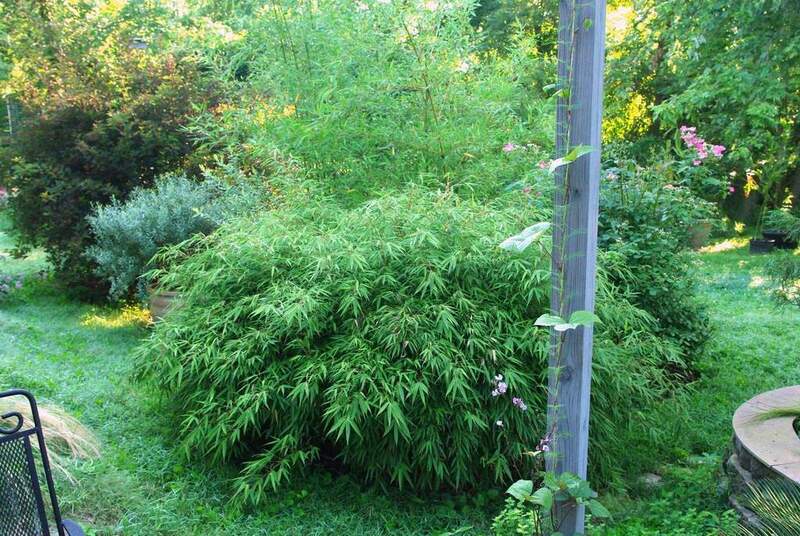 This Fargesia 'Rufa' bamboo is my oldest, having been planted in 2006 when I built the patio. It's really quite beautiful now, but is getting too wide. 'Rufa' is a clumping bamboo that will eventually get probably 8' tall and 10' wide or more which is way too big for this spot, unless I want to close off this end of the patio with a wall of bamboo. I don't think I want to do that, so I'll start taking divisions from this plant this year to reduce its size a bit. So that's a look at the patio area of my yard. Let me know if you have any questions about plants or anything. More looks at the rest of my yard soon. Alan, absolutely beautiful. 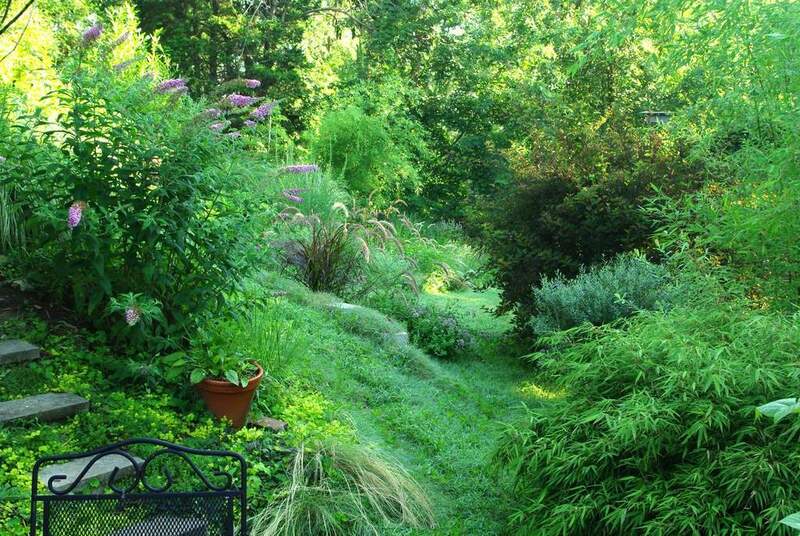 Your yard truly is a paradise, and I thoroughly enjoy looking at photos of it. That lushness is something we only dream about. Your humidity is definitely a benefit in that regard. Alan, what's the grey-green plant in the pot behind, left, of the rufa? It looks like what we call a navajo willow, that grows native and rampant here in Oregon. Whatever it is there in your garden, its quite handsome tucked into all those emerald greens, in a pot. Keeps catching my eye in photos of your SPECTACULAR garden. Gerhard: Thanks! We get a taste of hot, dry days (with winds usually) once in a while, so I know how difficult that can be. Can't say I enjoy the humidity though. Growing Habit: that is indeed a willow, Salix purpea 'Canyon Blue'. It's a beautiful plant, but I can't let it dry out. Growing Habit: I forgot to say that a post with plant labels is a good idea. It will require some work, but will be worth it. 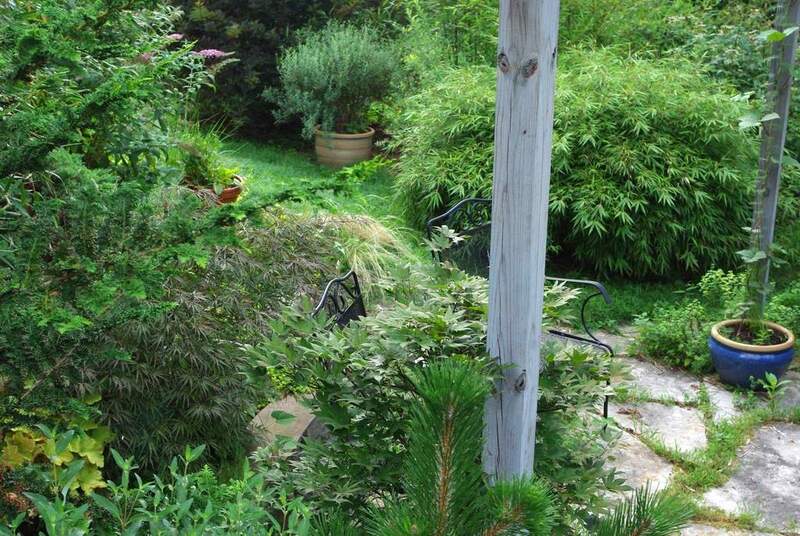 Your panoramic photos give a real feeling of the garden. I would like to see labels as well, if you got nothing better to do!